This is the ONLY power bank you will ever need, charges a Smartphone and a Tablet simultaneously. Applications include universities, company staff gift or a wonderful logo marketing gift for clients. 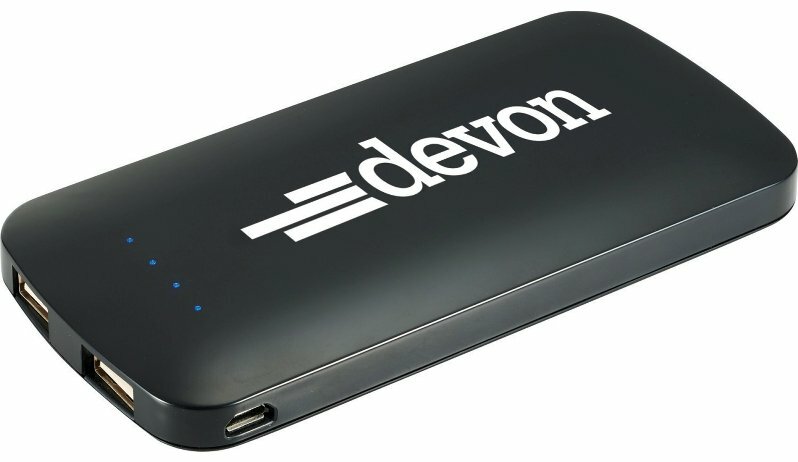 portable power source for Smartphones, USB cable included. Powers Tablets and MP3. Input: 5 V/1000 mA. Output: 1.5 V2100 mA and 2.5 V100 mA total dual output. Approx. life 1000 cycles. Battery life check button allows quick determination. Overall size is 5 L x 2 5/8 W x 1/2 thick. Individually gift boxed. Price includes a one color imprint on case one side in area 3" w x 1 1/2" h.